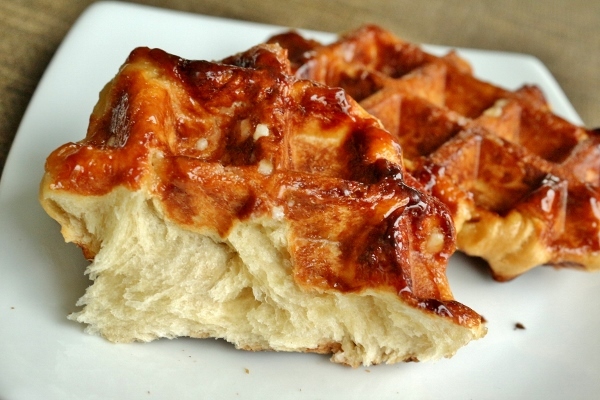 Most Americans who have eaten Belgian waffles at Sunday brunch (or even in their own kitchens) haven't really eaten Belgian waffles. 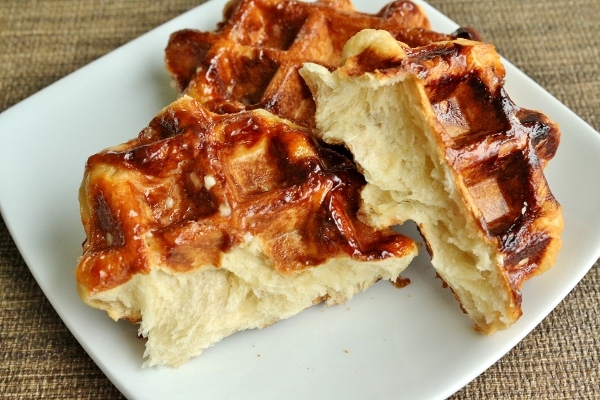 Just because a waffle is baked in a Belgian-style waffle maker does not automatically make it Belgian. 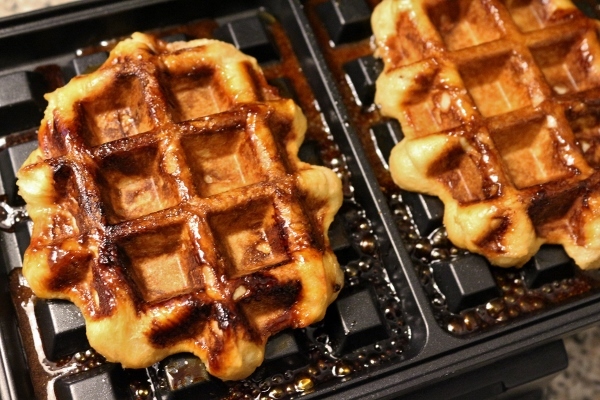 The waffle maker itself does yield bigger pockets (perfect for filling with syrup and other toppings), but if we're going to get technical, a true Belgian Liège waffle (aka a Belgian sugar waffle) is very different from its American cousin. 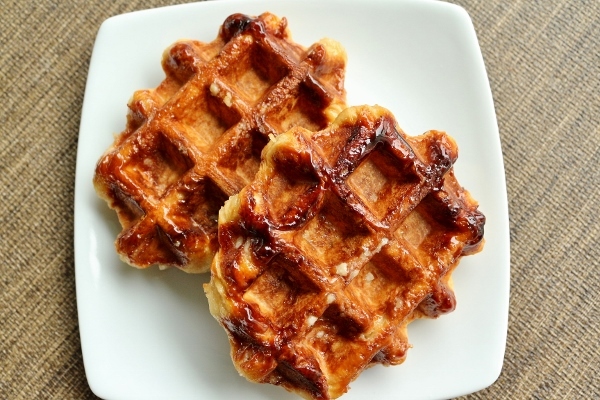 Authentic Liège waffles are more time consuming to prepare, and feature a rich and buttery yeasted brioche dough studded with Belgian pearl sugar. I've scoured the internet looking for authentic recipes for Liège waffles and bookmarked several, but I found the version on Smitten Kitchen to be the winner, and adapted it to make a half recipe for brunch in honor of Father's Day and my mom's birthday this past Sunday. The evening before I planned to make the waffles, I started on my dough, enriched with tons of butter and an egg, it's made with yeast instead of baking powder, giving these waffles a much more complex flavor and texture. After the dough proofs for a couple hours, it's deflated and refrigerated until the next morning. This is when the magic happens. We fold in the Belgian pearl sugar! Belgian pearl sugar can be a bit challenging to find. I actually purchased mine a couple months ago at Kalustyan's in New York City (a whopping $5 for a small 3-ounce bag--eek! 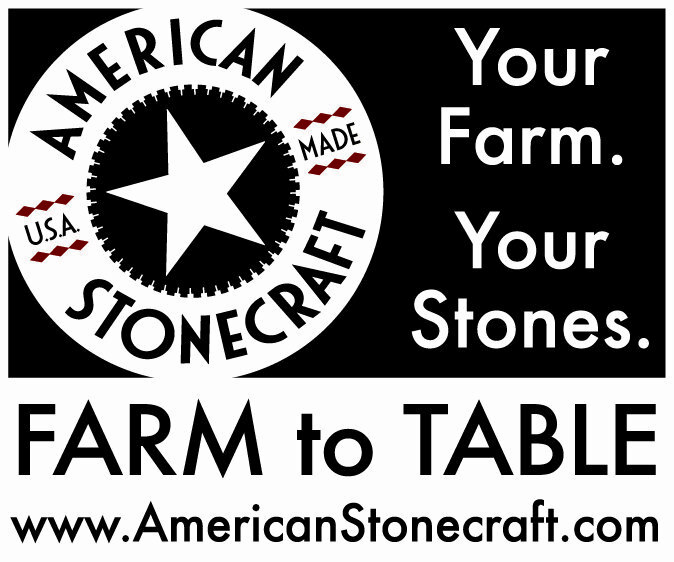 ), but it's readily available online (a much better deal than I got) and in other specialty shops. 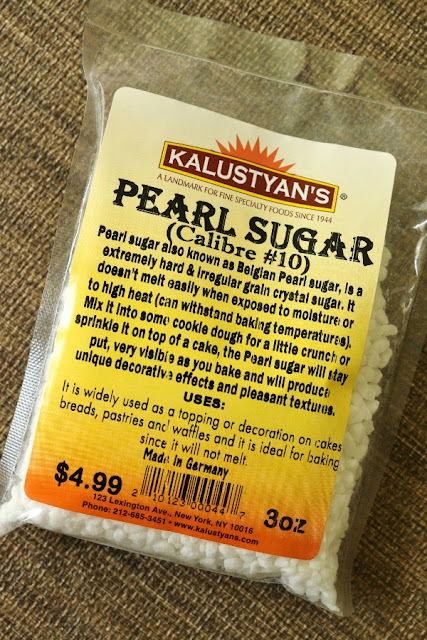 Do not confuse it with Swedish pearl sugar, which is vastly different and not a direct substitute. 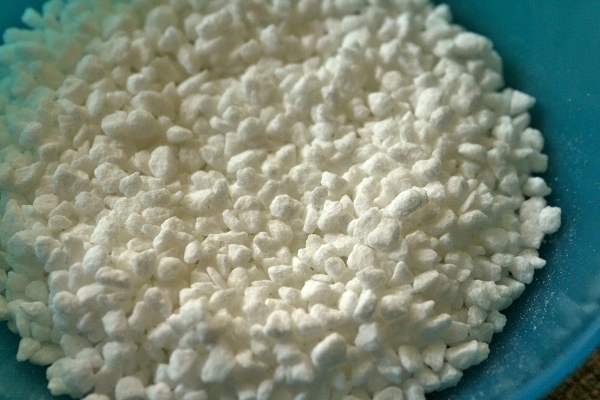 You can learn more about pearl sugar here. You can also try using roughly crushed sugar cubes, although the result isn't quite the same. My purchase from Kalustyan's only yielded 3/4 cup of Belgian pearl sugar, which was not enough to make a large batch of the Liège waffles. With that said, I also knew these waffles would be especially rich and sweet, and although they can be frozen, I decided to just make as much as we would eat in one sitting, so the half recipe (below) yielding 8 waffles was just fine, since they are quite decadent. If you've never eaten a real Belgian Liège waffle before, let me enlighten you a bit on the experience. It's very different from what you'd expect. 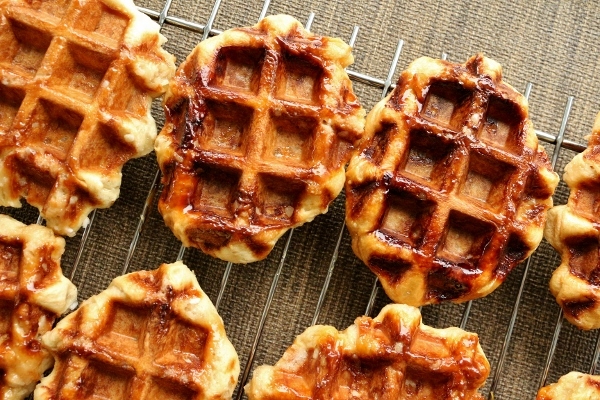 These waffles are crunchy, chewy, buttery, rich, yet delicate, sugary sweet, and so exquisite. It's almost like waffle meets candy; so much more than your basic breakfast. 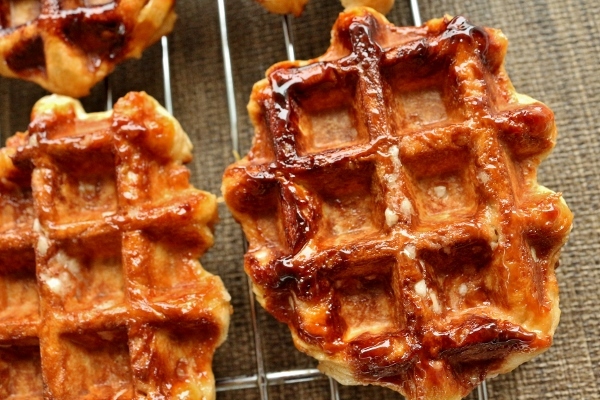 What happens is the pearl sugar begins to soften in the waffle iron, creating pockets of soft sugar within the waffles, and caramelized sugar coating the pan. 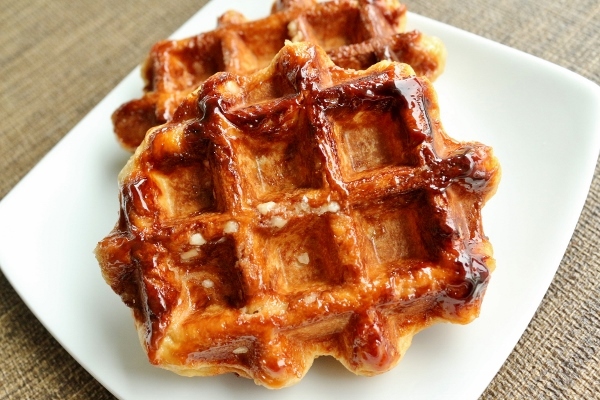 When you make more waffles, the caramelized sugar almost becomes like a shellacked sugar coating on the waffle's exterior, resulting in a glistening, golden crunch. For that reason, these waffles really must be enjoyed warm, because once they cool, the sugar cools too resulting in hard waffles. You can easily rewarm them in your oven, if needed. Liège waffles had been on my to do list for some time, and I'm so glad I finally got a chance to make them. The results were fantastic, and I highly recommend this recipe if you'd like to give it a shot yourself. I would like to add, however, that cleaning my waffle iron after the fact was a tremendous pain. The sugar was caramelized and hardened quite drastically, and it was much more complicated to clean than wiping down with a wet paper towel. I actually had to pour hot water onto the bottom plate (very carefully since you can't submerge the machine in water--mine is electrical and not a stove-top version) and then use a small brush to scrub and loosen the sugar, then soak up the dirty water with a paper towel and squeeze it out, and then repeat two more times. Then I followed up with using wet and then dry cotton swabs to finish cleaning between the rows. It was a work out. In retrospect, it may have been easier to "soak" the interior with water while it was still hot, since allowing it to cool is what really caused the sugar to harden on the surface. I can see why having a waffle maker with removable plates would make it SO much easier to clean after Liège waffle-making. Typically, the waffle maker isn't this difficult to clean, but the caramelized sugar really makes it a doozy. Just beware... for that reason alone, I'd be hesitant to make these again. They are fantastic, but require extra elbow-grease for cleaning up afterwards. I'll just save them for special occasions! Make dough: Warm milk between 110 and 116 degrees F, and place in the bottom of a large mixer bowl. Add sugar and yeast and stir to combine. Set aside for 5 minutes until the yeast looks foamy. Whisk in eggs and vanilla, then stir in all but about 1/2 cup flour (eyeball this) using a spoon or the dough hook of a stand mixer. Once the flour is mostly combined, add the salt and continue to mix. 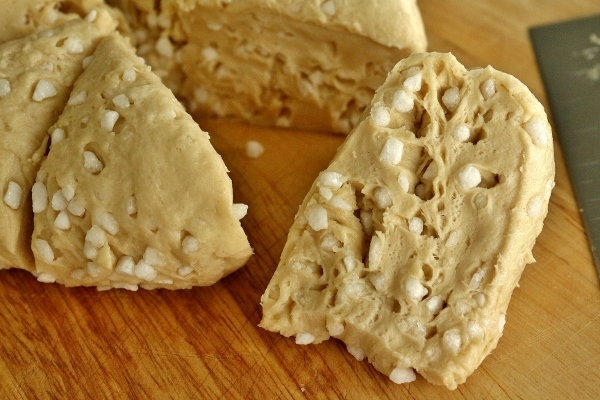 Using the dough hook of a stand mixer, add the butter, a spoonful at a time, thoroughly kneading in each addition and scraping down the bowl as needed before adding the next until all of the butter has been mixed in. 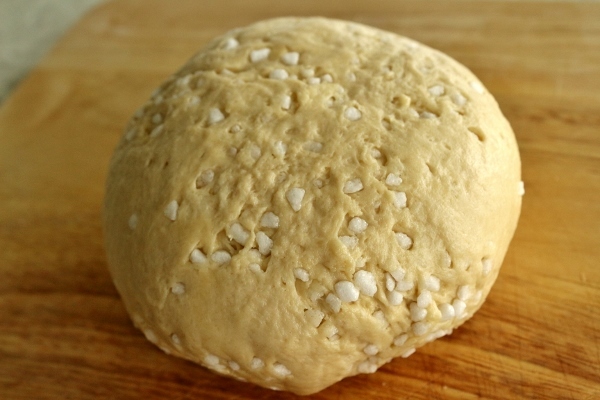 Add the remaining flour and knead with dough hook on low speed for 5 minutes, or until stretchy and glossy. For fridge first, cover bowl with plastic wrap and leave in the fridge overnight, or up to 24 hours. The dough will not look fully doubled when you take it out. The day you'd like the make the waffles, bring the dough back to room temperature for 60 minutes, stir to deflate, and let rise again for another 1 1/2 to 2 hours. To cook the waffles: For both methods, on the day you're ready to make the waffles, knead in the pearl sugar (I did this in a few separate additions of the sugar by flattening the dough, topping with about 1/3 of the sugar, then folding it into the dough, and then repeating twice more until it becomes a homogeneous dough). 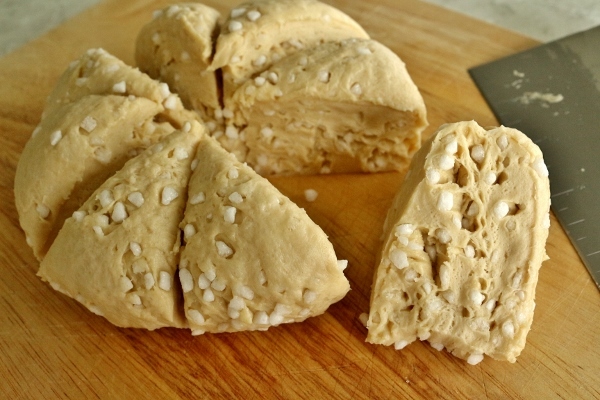 Divide dough into 8 mounds. If it's rather warm and greasy, you can return these balls of dough to the fridge until you cook them off. 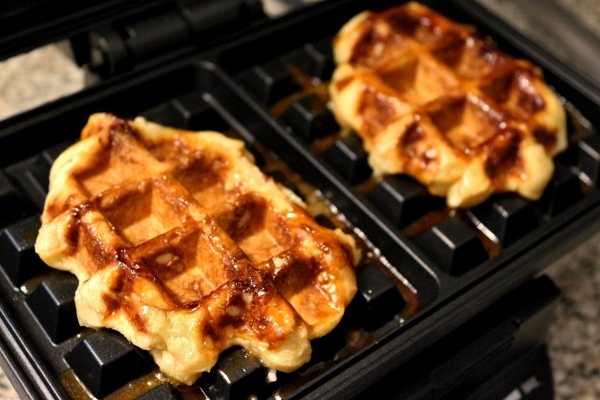 Heat your waffle iron, preferably a deeper Belgian-style one, over medium to medium-high heat. No need to oil or butter if it's nonstick and in good condition. Place the first ball of waffle dough on grid and cook according to waffle maker's instructions (depending on your waffle iron, you may be able to cook several waffles at once--mine has a capacity for two rectangular waffles; if you have a round waffle iron, you can also fit two of these smaller waffles at a time, although the rectangular waffle iron shape is more authentic to this style waffle). Cook until deeply golden all over, which will take approximately 4 to 5 minutes, then carefully transfer with tongs or a fork to a cooling rack. Remember, they're loaded with molten sugar; they're very hot. Repeat with remaining balls of dough, adjusting temperature of waffle iron as needed to get the color you want. 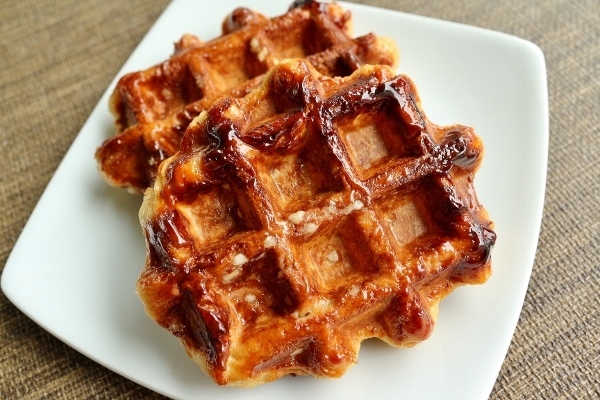 You'll likely find that the waffles look more caramelized and glossy as you go on, as bits of melted sugar stay behind and gloss the next waffles; this is the best part but also a cause to the headache of cleaning the waffle iron--we'll get to that later. Keep waffles warm in a 200 degree F oven if you plan to eat them right away. As the waffles cool, they will harden (that's all the melted sugar firming up), but will soften again when you rewarm them. These waffles should always be eaten warm.